New changes in mortgage policy were announced by the Consumer Financial Protection Bureau in their “know before you own” campaign. These changes will make it easier for potential home buyers to compare mortgage rates while looking at new homes for sale. It will also allow loan customers to check their loan amount, interest rate, payments, closing costs, and any other terms and conditions. This is great news for those looking to buy a home, as buyers typically need to borrow 90% of the price of their home. The changes take place in a variety of different areas, and make it easier for a home buyer to fully understand the full cost of home buying. One of the major changes to be implemented is the converging of four documents into two. The new Loan Estimate document will replace the Good Faith Estimate and the first Truth-In-Lending Statement. The second document, known as Closing Disclosure, will combine the HUD-1 Settlement Statement and the final Truth-In-Lending statement. 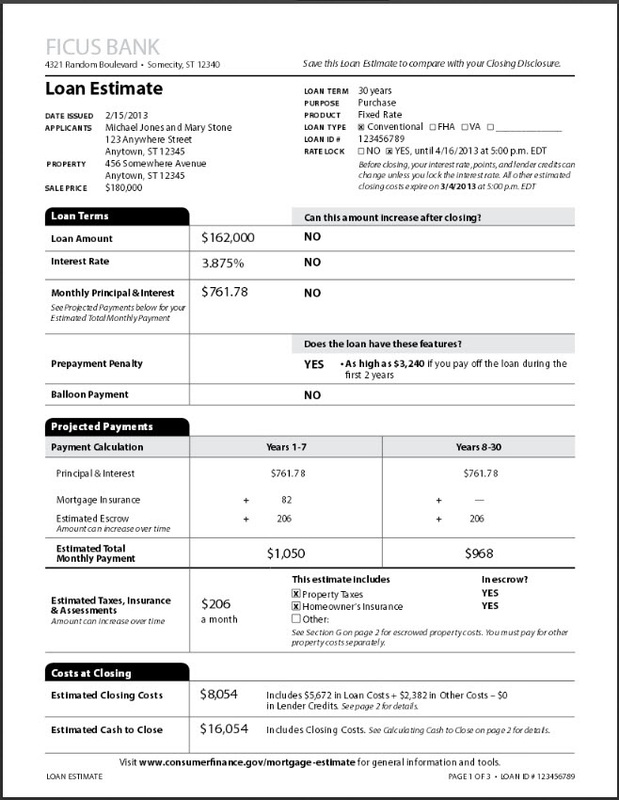 To help ease home buyers through the mortgage process, the new Loan Estimate has a full page that is specifically designed to help a home buyer to understand the full cost of the mortgage. This includes a calculation of what the borrower would have already paid after five years into the mortgage. They also contain an estimate of the APR rate, which can be used to compare mortgages side-by-side. This is great news for someone who is unfamiliar with mortgage terms, such as first time buyers. In 2014, 38% of home buyers were first-time buyers, and that number continues to rise as the younger generation grows into adults. If you’re confused about the home buying process, it may be beneficial to do some research before diving into searching for homes for sale. A staggering 92% of buyers use the Internet in some way during their search process, as it is a great tool for research needs. If you have any other questions, or aren’t sure where to start, contact your local Realtors for more information. Tuesday night was our bi-weekly meeting at J&A Realty and it was an action-packed one. Not only was it Mrs. Johnson’s birthday but Donte Harris, the branch manager for Primary Residential Mortgage, stopped by to give a talk. Mr. Harris talked extensively about the new changes that have taken place with the GFE or Good Faith Estimate. These are changes that you the consumer should be aware of because they directly effect your home buying experience in what we believe to be a positive way. Before these changes the GFE was a complicated document that did not clearly or effectively communicate information to the home buyer. Now the GFE is a standardized 3 page document with clearly labeled items. The two images shown here are an examples of the old GFE and the new GFE forms. The old GFE form is on the left and the new GFE form is on the right. Without even looking at the numbers it should be clear that the new GFE forms are much less obscure and much easier for the average consumer to understand. These factors will make understanding your loan estimate much easier and remove some of apprehension that is commonly associated with home buying. Buying a new house is one of the most exciting milestones in a person’s life. However, many potential home buyers are new to the home buying process, and have no idea how to even begin looking. Approximately 43% of home buyers believe the first step is to look online for property, but many are unaware of the other steps that should be taken first. Here is a simple, step-by-step guide for the home buying process. Check Your Credit Credit scores are important because they affect the kind of home loans you can qualify for. Credit scores range from approximately 300 to 850, and the higher a home buyers credit score, the more likely they’ll be able to qualify for an agreeable loan. According to law, every person is allowed one free copy of his or her credit report, and there are many online sites that can conduct the check for you. When checking your credit score, look for any errors that you can dispute, which may help raise your score. Get Pre-Approved Unless you have thousands of dollars in cash laying around, you will most likely need to take out a loan to pay for your new home. A study of home buying in 2013 showed that home buyers typically finance 90% of the home price through a mortgage. Before you are able to look at new homes for sale, apply to several lenders to get pre-approved for a loan. This will allow you to get a more complete picture of what you can afford, before you start talking to local Realtors. Shop For a Home Before conducting a search for a new home, take a minute to think about what kind of house you want to look for. Think about what kind of space you need, the neighborhood you want to live in, and any other factors that might affect your decision. Once you know what you want, it’s time to turn to the Internet. Ninety-two percent of home buyers use the Internet is some way during their home search process. If you’re not comfortable using the Internet, contact a real estate agent and ask them for their listings. Make an Offer Once you’ve found the perfect house, it’s time to make an offer. Sellers tend to price their homes higher than they are willing to sell, in case haggling is involved. Base your offer on other comparable houses in the market. Once the price is agreed upon, a contract will be written up with all the terms of the sale. Whether you’re a first time buyer, or relocating to a new area, searching for a house to buy can be a stressful process. There are many things that have to be considered when purchasing a house, and it can be easy to forget some of the crucial aspects of the property that will affect the quality of your life. Here are 3 important things you’ll want to keep in mind when looking at a potential home for purchase. Neighborhood When looking at new homes for sale, you want to make sure that the surrounding area is a location you can envision yourself in for at least 10 years. NAR’s 2013 Community Preference Survey showed that 78% of home buyers surveyed believed that neighborhood quality is more important than the size of the homes for sale. Take a walk around the neighborhoods where you are looking to buy in, and take note of the conditions of the houses in the neighborhood, what kind of people live there, and if there are any community amenities like a park or library. If you’re unable to visit the neighborhood, utilize tools on the internet to do more research. Ninety-two percent of buyers use the Internet in some way during their home buying process. Bills Owning a home can be expensive. Along with mortgage payments and local taxes, there are other monthly bills that homeowners are accountable for. When looking at homes for sale, keep in mind the other costs that will go into owning the house. For example, large houses will likely have more expensive heating and cooling bills since there is more area to cover. Nine out of 10 buyers say they would rather buy a home with energy-efficient appliances that permanently lower utility bills over a home without those appliances that costs 2 to 3% less. Ask your local Realtors to provide you with the approximate cost of a month of utilities for a more accurate estimation of how much the home will cost you in the long run. Parking Parking can be one of the easiest things to forget when comparing multiple locations. Consider how many cars you will have at the house, and whether or not there is a driveway big enough to fit them all. Even if your house does have a driveway, it’s good to check the status of street parking and if there are any regulations that need to be observed. Tricky parking laws can make it difficult for any friends or relatives who come to visit. If you’ve been considering buying a house for the first time, the process can seem discouraging. Buying a house is one of the biggest purchases of a person’s life, and first-time home buyers often have no idea how to even begin looking for a house to purchase. If you’re looking to buy a home for the first time and are confused, you’re not alone. About 38% of home buyers were first-time home buyers in 2014, lacking the experience needed to traverse the home buying market. Here are a few things you should know before putting an offer on your first home. The first step in buying a new house is research. Approximately 43% of home buyers believe that the best way to start the home-buying process is looking online for property, and a total of 92% of buyers use the internet in some way during their search. Use the internet to find out about the different neighborhoods you are considering moving into, looking into the average price of a home and taxes. It may also be good to check out the local shops and restaurants, and see if there are any annual events that may affect your decision. Make sure your qualify for a mortgage, and decide which option is the best for you. When shopping for a mortgage, and try to avoid mortgages that don’t offer a fixed interest rate. Consider other expenditures that may need to be made, such as homeowner’s insurance, a security system, moving van, and any renovations that you may have to do when budgeting out your total home purchase amount. If you’re still unsure about the process of home buying and all the steps that are a part of it, consider attending a home buyers workshop. These seminars provide new potential homeowners with a variety of home buyer seminars on topics such as how to get a home loan, managing your finances, and can even give you tips for the future if/when you sell your home.